This book features simple recipes for every occasion shown in more than 300 step-by-step color images. 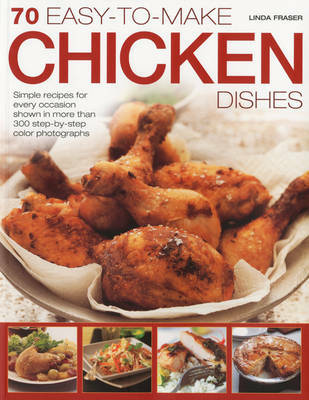 An inspiring collection of over 70 gourmet chicken dishes for special occasions and entertaining. Easy-to-follow instructions for each recipe, with step-by-step photographs. Five delicious chapters to tempt you: Starters; Roasts & Bakes; One Pot Dishes & Casseroles; Grills & Barbecues; and Pies & Pastries. This book offers comprehensive advice on preparing poultry and basic cooking techniques including: jointing, boning, frying, spatchcocking, sauteing, poaching, casseroling and braising. Every finished dish photographed in full color. This mouth-watering collection of recipes includes classic dishes from all over the world as well as some exciting new taste sensations. With over 70 recipes, there are dishes to suit everyone - spicy wings, rich pates, elegant roasts, exotic curries, melt-in-the-mouth casseroles, flavorsome grills and irresistible pies. A comprehensive introduction covers techniques for preparing and cooking chicken. For all recipes, the key stages of the step-by-step instructions are illustrated, and the finished dishes are shown in superb color photographs.Whether you are planning an elaborate menu or simply want to turn a family meal into a special occasion, this wonderful volume will provide you with inspiration.